Admission: $2.00 per person and 12 years and under are free. Hours of Operation: 10am to 5pm, Monday through Saturday. From Memorial Day to Labor Day, we are open on Sunday from 12pm to 5pm. Because the Union Stockyards company lacked the funds to buy enough cattle to attract local ranchers, President Mike C. Hurley invited a wealthy Boston capitalist Greenleif Simpson to Fort Worth in hopes he would invest in the Union Stock Yards. When Simpson arrived on the heels of heavy rains and a railroad strike, more cattle than usual had accumulated in the pens. Seeing this, he decided that Fort Worth represented a good market and made plans to invest. Simpson invited other investors to join him, one of whom was a Boston neighbor, Louville V. Niles whose primary business was meatpacking. On April 27, 1893, Simpson bought the Union Stockyards for $133,333.33 and changed the name to the Fort Worth Stockyards Company. It soon became apparent that instead of shipping to other markets to process the cattle, it would be much more desirable to keep more of the business in Fort Worth by having local packing plants. A search began to lure major packers to the City. By about 1900, after much work by local businessmen, both Armour & Co. and Swift & Co. were persuaded to build plants adjacent to the Stockyards. Construction began in 1902, but not until after the exact site of each plant was decided by a flip of the coin. Armour won the toss and selected the northern site and Swift began to build on the southern tract, which was the site of the original Livestock Exchange and Hotel. Swift & Co. received an unexpected financial bonus when a large gravel pit was found on the southern site that was ultimately used in the construction of both plants. The new Livestock Exchange Building in its present location, as well as the pens and the barns, were also started in 1902. The new building was designed to house the many livestock commission companies, telegraph offices, railroad offices and other support businesses. 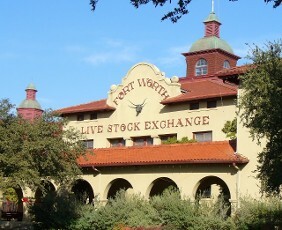 While construction was underway, the Fort Worth Stock Yards Company, which now included the two meat packers, incorporated much of the area north of the river adjacent to the Stockyards as North Fort Worth. In 1909 the City of Fort Worth annexed the new city with the exception of the Stockyards and the packing house property. Business boomed with the opening of the packing houses. Armour and Swift bought 265,279 cattle, 128,934 hogs and 40,160 sheep, which brought over six million dollars into the local economy. A livestock market that drew local farmers and ranchers had finally arrived in Fort Worth. Because of the success of the Stockyards, the necessity for an indoor show facility became obvious. In 1907 construction began on a grand coliseum that was completed in just 88 working days, in time for the grand opening of the Feeders & Breeders Show. The Coliseum, which today is known as the Cowtown Coliseum, was the home of the first indoor rodeo. It was used for many cultural, social, agricultural, and religious events as well. The Stockyards continued to prosper in spite of droughts and floods. In 1911, after two disastrous fires that killed a large number of the penned livestock, the yards were rebuilt with an eye toward using as much non inflammable material as possible. In 1911 a new town, Niles City, was chartered and grew up around the Stockyards and packinghouse properties. Niles City was known as “the richest little city in the world” with a property value of 30 million dollars. In 1923 Fort Worth annexed this area. At the height of World War I in 1917, the Fort Worth Stockyards was the largest horse and mule market in the world. Military officers from Allied countries came to purchase the animals to support their war efforts. Total sales of all livestock continued to grow during the war years. During World War II, the Fort Worth Stockyards processed 5,277,496 head of livestock making 1944 the peak year of the entire operation. In later years sales at the Stockyards began to decline and by 1969 had dwindled to a mere 1,045,158 head. By 1986, sales reached an all-time low of 57,181 animals. Many reasons for the decline of the Fort Worth Stockyards can be stated, but one of the largest factors was the rise of the trucking industry on the newly paved roads after World War II. Because of their lower operating costs and greater flexibility, much of the advantage that railroads had in bulk shipping was lost. The market moved to the shipper with the creation of local livestock auctions and feedlots. It was a completely new way of marketing livestock. Not only was Fort Worth affected, all the major packers in the United States struggled with this new way to market livestock. Both Armour and Swift had huge outdated plants that were straddled with risings costs, wages and administrative expenses. Armour was the first to close their Fort Worth plant in 1962 with Swift hanging on until 1971. Partial demolition followed over the years after several fires. The unique Armour office building was lost, but the classic Swift headquarters building was put to use as the home of a popular restaurant during the 1970s. While local auctions continued to be held in the Stockyards, the volume diminished until it was unprofitable to continue. This vibrant part of Fort Worth history fell on hard times as the Stockyards area continued its decline. In 1976, the North Fort Worth Historical Society, founded by Charlie and Sue McCafferty, was chartered to ensure Fort Worth's livestock heritage would continue and be preserved. Since then, the Society has worked to promote the history of one of the greatest livestock and meatpacking industries in the country. The Fort Worth Stockyards National Historical District was also established in 1976 and many of the area’s landmarks have been restored including the Livestock Exchange Building and the Coliseum. Recently, the historic Swift & Co. headquarters building underwent an almost total restoration. In 1989, the North Fort Worth Historical Society opened the Stockyards Museum in the historic Exchange Building. It now hosts thousands of visitors from all over the world each year. Its facilities and collections are expanding to handle the ever increasing number of visitors. Weekly livestock auctions ceased many years ago, but the Stockyards continues to host special breed events and sales including Longhorn auctions. Many thousand of head of cattle are still sold in the Stockyards every week via video/satellite sales originating in the Exchange Building. The livestock legacy lives on. Today the Fort Worth Stockyards Historic District is one of Texas’ most popular tourist destinations. Many events of all kinds are held every year, new businesses and lodgings have been established adding to the history and fun that is the Fort Worth Stockyards. As a Blue Star Museum, the Stockyards Museum is part of a national appreciation program for military families as a way to say "thank you." 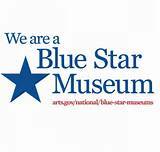 Blue Star Museums is a collaboration among the National Endowment of the Arts, Blue Star Families, the Department of Defense, and more than 2,000 museums across the United States. The program runs through Labor Day (Monday, Sept. 1, 2015). This free admission program is available to any bearer of a Geneva Convention common access card (CAC), a DD Form 1173 ID card (dependent ID), or a DD Form 1173-1 ID card, which includes active duty U.S. military - Army, Navy, Air Force, Marines, Coast Guard, as well as members of the National Guard and Reserve, U.S. Public Health Service Commissioned Corps, NOAA Commissioned Corps - and up to five family members. $2 per person and 12 and under is free. Located in the historic Livestock Exchange building, built in 1902, we are in the heart of the Fort Worth Stockyards National Historic District. The Museum features artifacts from the Stockyards and the Swift and Armour Packing Plants. You will also find saddles and other cowboy collectibles from the cattle drive era to contemporary times. Learn more about the Fort Worth Stockshow, American Indians of the area and Camp Bowie. Be sure you see the 104 year old light bulb which is still burning and the Bad Luck Wedding Dress. There is something that will interest almost everyone at the Stockyards Museum. The North Fort Worth Historical Society first opened the Stockyards Museum in 1989 using a small space to share its historic archives with the public. From this modest beginning, the Stockyards Museum has now grown to host thousands of visitors who come from all over the world. In addition, the museum is a highly respected resource for writers, academics, historians, restoration specialists and genealogists. The Stockyards Museum is a casual, friendly place welcoming families and permitting cameras. It’s a great place to spend some time capturing the true feeling and history of the Stockyards. Volunteers from the NFWHS are present to offer explanation and provide further information on all of the photographs and artifacts on display. Stop by for a visit and step into the past!